Earlier this week, fall archives intern Doris Straus shared highlights from the collections she processed while at the Academy. Today, she presents the rest of her discoveries. I processed the papers of Dr. Lewis Gregory Cole papers next. Dr. Cole (b. 1874), a radiologist, had an active social life during his time at Columbia College of Physicians & Surgeons. 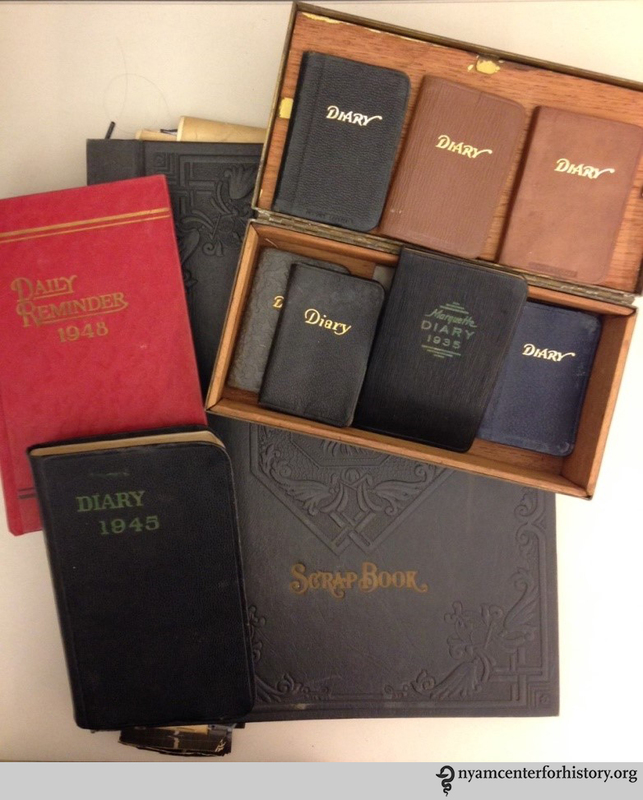 His papers (1892–1954) include a large collection of lively personal correspondence from male and female acquaintances, dance cards, wedding invitations, calling cards (mainly from female friends), and other social ephemera of the late 1890s. The correspondence from his university years and the early years of his career are a fascinating look at social interactions between young men and women at the turn of the 20th century. Dance cards from the Cole papers. There is an invitation for a bicycle ride and mention of a gift of a box of chocolates to a young lady friend, and years of correspondence from “your true chum, Joe,” who was studying at Cornell and who complains about all the weddings they have to go to. 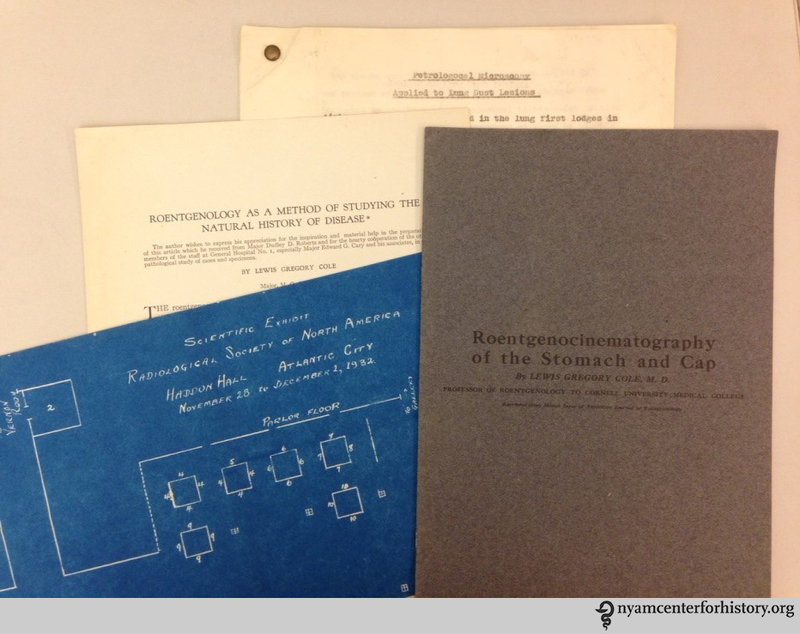 Though there is more personal correspondence here than scientific, numerous papers and correspondence relates to Dr. Cole’s work with roentgenology (radiology). A 1931 letter to Dr. Cole from a fellow radiologist at the Cleveland Clinic requests “a signed photograph of yourself for my collection of eminent radiologists.” Dr. Cole wrote two textbooks, contributed to other texts, and authored more than one hundred articles in medical journals. He also developed a table, known as the “Cole table,” for the diagnosis of duodenal ulcers. Scientific materials from the Cole papers. The Dr. Joseph R. Kuh papers, 1935–1994, also contain a great deal of personal correspondence, along with diaries and notes documenting Dr. Kuh’s service during World War II and the Korean War. Dr. Kuh (1919–2012) was a certified internist and practiced privately from his Manhattan brownstone for many years. Of note in the personal correspondence is the reporting of historic events. A June 6, 1944 letter from Dr. Kuh’s father to both his sons reports the events of D-Day as experienced in the Kuh family apartment on West End Avenue. The letter tells of constant prayers being offered on the radio in addition to the news, and of the major department stores “Stern’s, Lord and Taylor, Franklin Simon” closing early. “Their windows bore a notice ‘Due to D Day, we felt that our customers as well as our employees would want to spend the day in prayer, and so we have closed for the remainder of the day.’” Other newsworthy events include Dr. Kuh’s first wife, Jean, a Barnard student, writing about the plane that crashed into the Empire State Building in July of 1945. Diaries from the Kuh papers. I also processed the Dr. Alfred Braun papers, 1898–1983. Dr. Braun was a native of Hungary, a Columbia University College of Physicians & Surgeons alumnus who specialized in otolaryngology, and a gifted painter. He was one of the founders and past officers of the NY Physicians Art Club. The collection includes scientific materials, a number of art awards, and correspondence with American businessman Armand Hammer, who appears to have been a friend. Other personal collections include the Dr. Gustav Aufricht papers, 1922-1963. Dr. Aufricht (1894–1980) was a native of Budapest, Hungary and is considered one of the founding fathers of American Plastic Surgery. He treated wounded soldiers during World War I and studied with the leading practitioners in Europe before arriving in New York in 1923. I also processed the Dorothy Fahs-Beck papers, 1929–1954. Fahs-Beck (1906–2000) was a research statistician who received her doctorate from Columbia University in 1944. Her greatest impact was as an innovator in the areas of human services research and dental practice research. She established the Fahs-Beck Fund for Research and Experimentation in 1993. The papers and records I had the good fortune to process are wide-ranging collections documenting the struggle to conquer diseases such as tuberculosis, polio, and rickets; record psychiatry and neurology as practiced in the early 20th century; chronicle the development and use of X-rays, vaccines, and antibiotics; record advances in diagnostic and surgical procedures; report evolving diet and nutritional issues for children throughout the mid-20th century; and document the beginnings of AIDS research in the early 1980s—all by organizations and individuals at the forefront of these issues. There is also enlightening correspondence and social ephemera from times long past, which help to complete the picture of a person or an era—even if it is just admiring the gift of a box of chocolates 120 years after the fact. 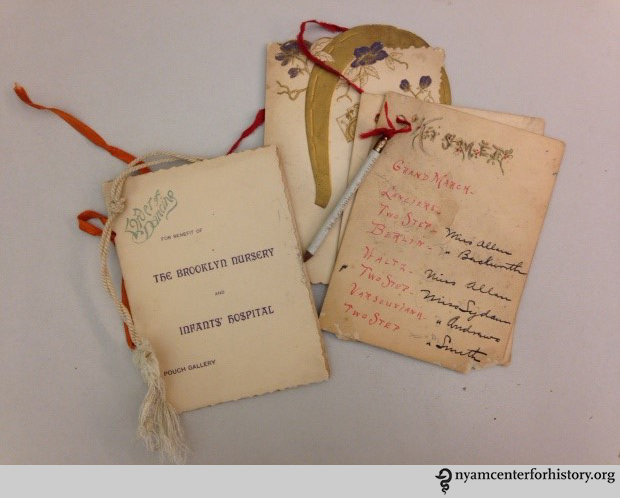 This entry was posted in Collections, History of medicine and tagged Alfred Braun, archival collections, archives and manuscripts, Dorothy Fahs-Beck, Gustav Aufricht, internships, Joseph R. Kuh, Lewis Gregory Cole by nyamhistorymed. Bookmark the permalink.